My little guy has scissor legs. When he’s happy or excited about something, he will pump the air with his legs in a combination bicycle/scissor motion while chortling contentedly, usually with his index and middle finger of his right hand in his mouth. He does this after diaper changes, during nursing sessions, while watching Blue’s Clues, and any other time that provokes feelings of happiness. Sometimes when he’s Scissor Legging in his bouncy seat, he’ll inadvertently thump his legs down with a force tremendous enough to shake the floor. I marvel at his flexibility. He nonchalantly plants his feet on his face, making him look like a master contortionist and providing his mommy and daddy with endless hours of amusement. There is no such thing as boredom in this house. 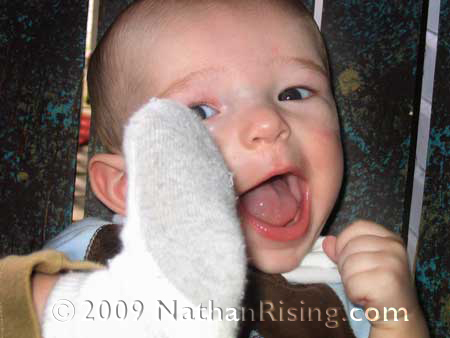 This entry was posted by Jen on August 23, 2009 at 1:29 pm, and is filed under All About Nathan. Follow any responses to this post through RSS 2.0.You can skip to the end and leave a response. Pinging is currently not allowed.